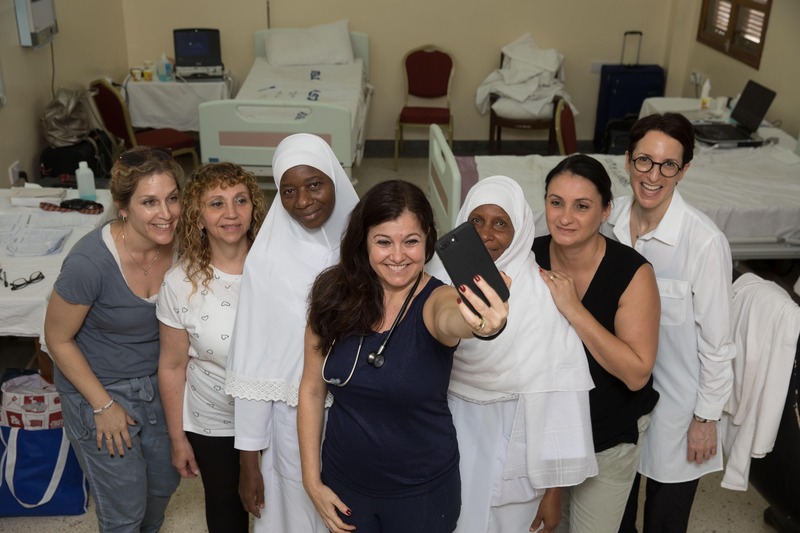 A joint effort by 5 Israeli female physicians and a local Zanzibar medical team succeeded on Save a Child’s Heart’s annual mission to Zanzibar to screen 398 children. The mission was sponsored by Save a Child’s Heart Canada. On February 14th, 2019, five female medical professionals and philanthropists affiliated with Israel’s Save a Child’s Heart organization flew to Zanzibar and took part in an annual mission designed to save the lives of children suffering from congenital and acquired heart defects and in need of lifesaving medical care. The team was comprised of Dr. Alona Raucher Sternfeld, Head of the Pediatric Cardiology Unit at the Wolfson Medical Center (WMC) in Holon, Nava Gershwin, Head Nurse of WMC’s Pediatric Surgical Ward, Yifat Brosh, a WMC Medical Technician, Debbie Silver a SACH volunteer and board member, and Tamar Shapira, Director of International and Public Relations at SACH. Once in Zanzibar, the Israeli delegation joined forces with a team from the local Mnazi Mmoja Hospital, led by Dr. Omar Suleiman, a dedicated and talented doctor trained by Save a Child's Heart in Israel, who has since become a key partner of the organization in Zanzibar. Ahead of the 2019 mission, Dr. Suleiman was quoted saying, "Our cooperation with SACH inspires us, and fills us with optimism. There is so much that needs to be done, so many children to save, and we are very grateful for this partnership and joint mission.” Throughout the course of the seven-day mission, the teams examined and diagnosed 398 children. Some were examined as a follow-up to a lifesaving procedure that they previously received in Israel, while others in need of similar lifesaving treatments were assessed ahead of their impending future travels to Israel’s Wolfson Medical Center. Highlights from the trip included seeing Sulha from Zanzibar who was treated six years ago at the WMC. She came for a follow-up examination as part of the 2019 Zanzibar mission. and we are happy to report that she has recovered well and is able to play with her siblings & friends and attend school. Another story of hope and healing is that of Balkis. 19 years ago, the now 26-year-old woman underwent lifesaving heart surgery in Israel. During the 2019 Zanzibar mission, she returned to the clinic with her 10-month-old daughter, Fatma. Fatma was examined and diagnosed with the exact defect that her mother had and was treated for. It was determined that soon, Fatma would also be flown to Israel, to receive the medical procedure she needs.